Quarterfinal Presser released after the semifinal one..
Q. How pivotal was the first game in the final set when you were down Love-40? RAFAEL NADAL: Well, was very, very important for me, because the dynamic of that moment was bad for me. Save that game with three serves was like a big comeback. You know, when you are playing final set against a big server like Tomas, it's very important to be focus all the time with your serve. If you lose your serve, the opponent gets a lot of confidence, and it's very, very difficult to come back. So was very, very important. I think after that game my serve worked really well in all the third set. I didn't have a chance before with the return because he was serving fantastic, I think. I was with positive attitude in the third set at the end, so when I you had the chance, I converted. So it was very important. Q. We know you try not think about these things, but there's been so much talk about you meeting Roger here, and it's been six years since you played in the States. Was that hard to keep out of your mind? Were you able to keep it out of your mind? RAFAEL NADAL: During the match today? RAFAEL NADAL: No. Today? No. For sure no. For me, every day is completely different, no? I am focused about the quarterfinals match. I don't think about semifinals before quarterfinals. I know I play against No. 6, of the world, No. 7, I don't know, it's going to be a really difficult match. I think I started the match playing fantastic. I think I played at my highest level the first set. Very happy about how I was playing. I don't know what happened at the end of the first set. I had a little bit of bad movement with the right arm and some nerve hurts and I started to feel something here (pointing to outside of arm into neck) and Tomas started to play better. I think always is a little bit like this. When I had few mistakes I started to play with less rhythm. When he had the chance to go inside, to attack, and he did well. I think I lost a little bit of intensity. Q. How much concern is there about your arm for tomorrow night? RAFAEL NADAL: No, hopefully nothing. I think is nothing important for sure, no? (Through translation.) I felt like the nerve was inflamed so he felt like it was a little bit heavy like in this area and he got dizziness. 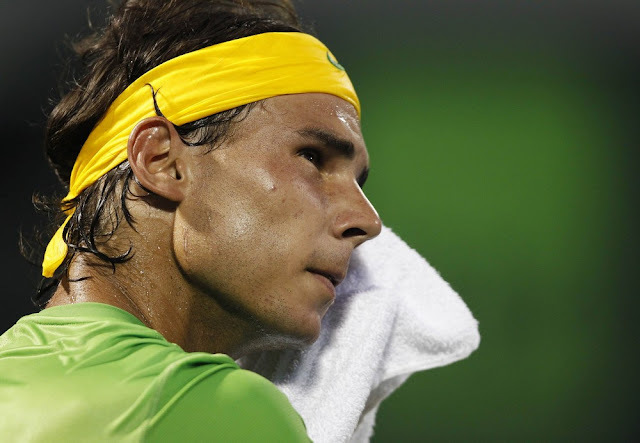 RAFAEL NADAL: So-so. You know, I did a little bit of treatment now after the match, and I going to do it more tonight when I arrive to the hotel. For sure it's nothing important. The most important thing is the right arm, so when it happen new, it's something if you don't know what's going on you lose the concentration thinking about the arm. But happen tomorrow it's not going to be nothing new. Going to be easier to manage the situation. So I am sure that the arm is not going to affect the match. Q. Has it happened to you before? Is it the first time? RAFAEL NADAL: No, first time in my life. Really strange. Especially since the left arm you can do aggressive movement or something, but the right was really strange. Seriously, I couldn't understand during the match what happened. Q. But you felt fine in the third set? RAFAEL NADAL: No, but I forget about everything. I tried to don't think about nothing. It's too important for me every match. When you are in quarterfinals of one tournament like this, playing well like I was playing, lose is painful, no? When you are playing bad and you are in quarterfinals and the opponent is playing better than you and you lose, you go home and you accept. But when you are playing well you have to win. I thought I had to win today, because at the beginning of the match I was playing at my highest level. Play better than the first set today just few times in my life, no? I was playing pretty good, no, so I was very happy. Because every day during the tournament, during the two weeks, I was playing better and better. Q. Is this a surface that fits perfectly with your game here? RAFAEL NADAL: All the surface fits perfect with my game when I am playing good. (Laughter.) When I am playing bad, all the surface adapts very bad with my game. Everybody happen the same. It's not like five or four years ago when I needed all the time a surface that the bounce gets higher. I think my game today is much better than before. I have a lot of options to do, and I think I am more complete player. When I am playing well I can play well in all the surfaces. In indoor I had good results, and hardcourt for sure. And even at the US Open that I never played well, last year I played really good. But normally Indian Wells and Miami, both are good hardcourt seasons for me. The surface works good for me for my game. Bounces are high and it's not too slow, so it's average court. Because a lot of people think I am playing better when the court is very slow, and I don't think that. I think I'm playing better when the court is a little bit faster. Q. Was it strange early in the third set when Berdych is playing really well, better than Nadal from the baseline, and Nadal is living with his serve and just surviving with that? RAFAEL NADAL: You know, my serve saved the match today. That's true. It's nothing usual for me the serve save me. But at the beginning of the set, that's the true, and that's a positive thing. Probably four years ago that's never going to happen. Now is another chance. If you don't have this chance four years ago probably I would lose that match; today I didn't. So that's always a personal satisfaction when you know your game is improved and there's for sure a lot of things to keep improving. Q. The rivalry with Roger, which everyone has enjoyed so much, what has it meant to you in your career? RAFAEL NADAL: You know, it's special always to play against him and have these matches, for sure very important matches for both of us in our careers: finals of Roland Garros, finals of Wimbledon, of Australian Open, a lot of finals of Masters 1000s. So important matches for our careers, no? So that makes our careers probably more special for both of us. Seriously, I think we always had the big respect for each other. We are closer than before, like friends, because we spend a lot of time together with exhibitions, with the council of the ATP. We have a fantastic relationship, no? This rivalry, I think everybody looks at it like rivalry. For me, it's like really special thing when we play each other. When I go on court against him I feel it's a really special match, especially because we play always really important matches. Tomorrow is a semifinals. Very few times we played in semifinals of one tournament. Only I think in two Masters Cups in Shanghai and one time here in 2004 second round, something like this. The rest of the matches are finals and important for big titles. That makes the rivalry very, very special. I don't know if rivals in the rest of the history of tennis played a lot of the matches, as many matches as we played. I don't know how many matches played McEnroe/Borg or Sampras/Agassi, but we played a lot a lot times. So that makes the match really special always.